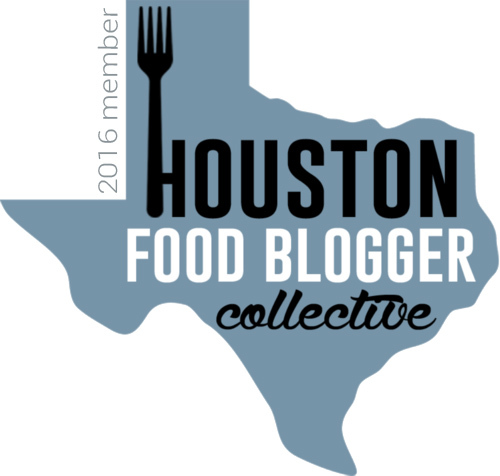 This post was done in partnership with Houston's The Union Kitchen, where I was provided with my food and drinks, free of charge. I was not monetarily compensated for writing this restaurant post. All opinions are completely, 100% my own! Today I am asking you to channel your inner pirate. Because we arrrrrre going to talk about some rum, matey! 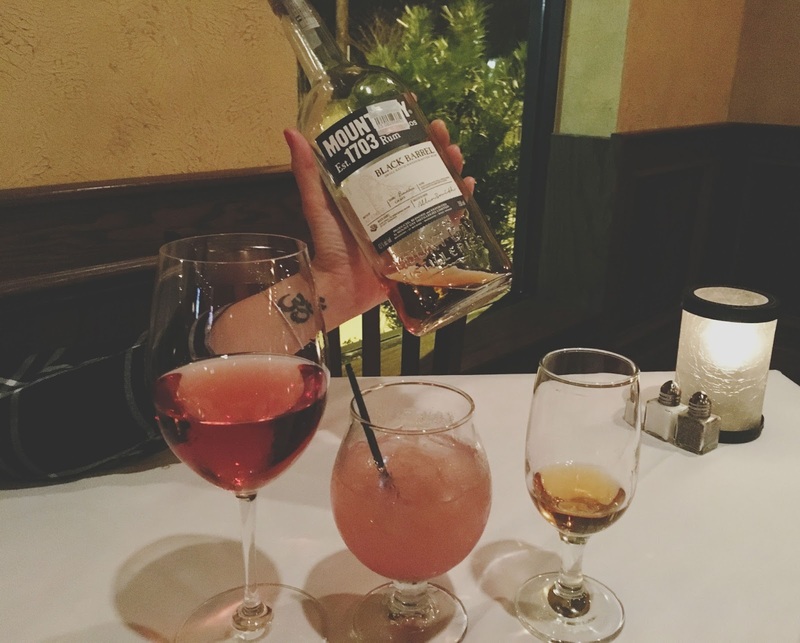 Last week, Jon and I were invited to try some new fun rum cocktails paired with fabulous food at The Union Kitchen in Houston's Memorial area. 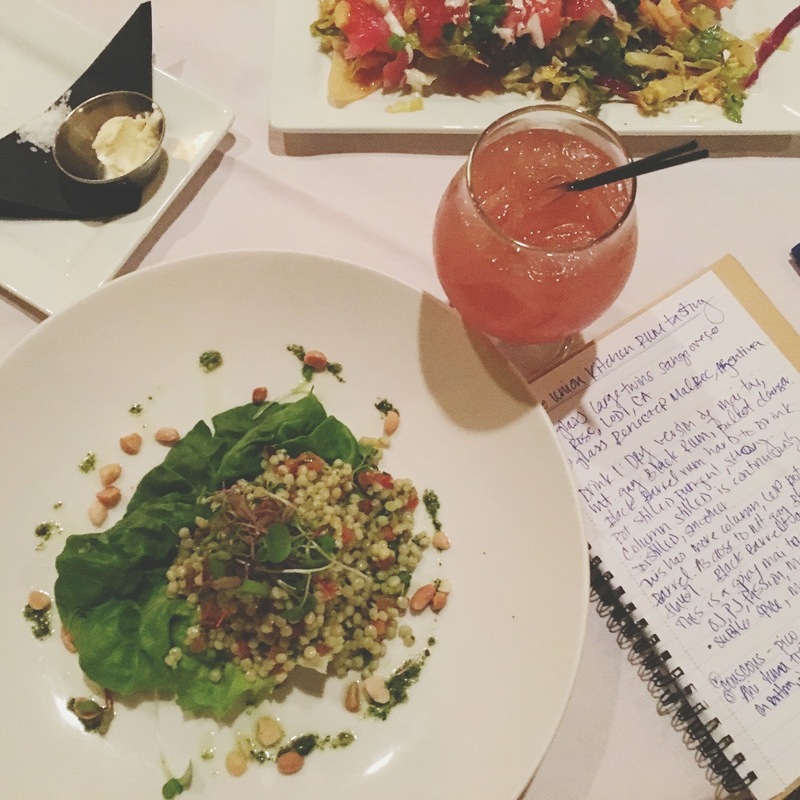 I had been to the restaurant's Memorial location once before to try their super refreshing fall garden-to-glass cocktails, as well as their Kingwood location a few years ago for dinner. I'm definitely a fan of this restaurant, and as a Houston Heights-area resident, I am happy to report that a new location is in the works out in my neck of the woods! 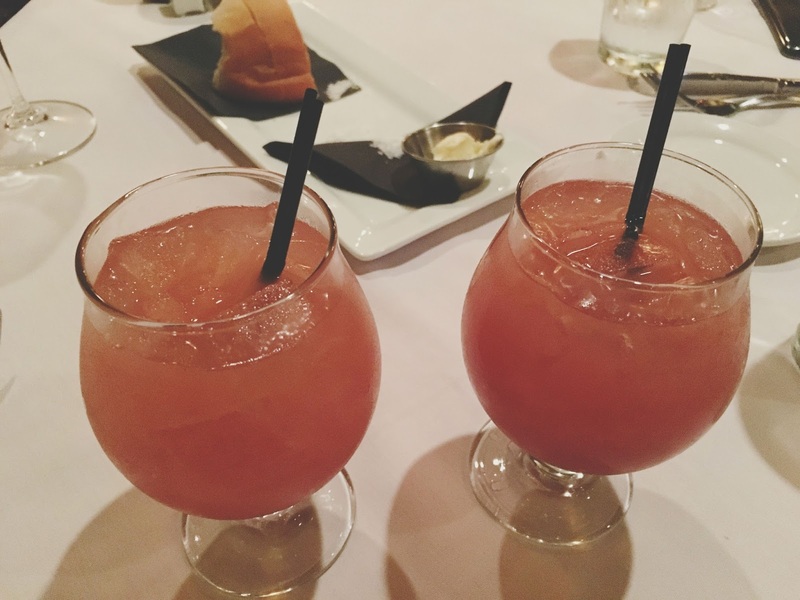 If you eat up Houston food blogs and articles like I do (I 100% promise you that the "eat up" pun was not intended, and I am 100% happy that it happened), you've probably noticed the buzz surrounding the rum drinks at The Union Kitchen recently. 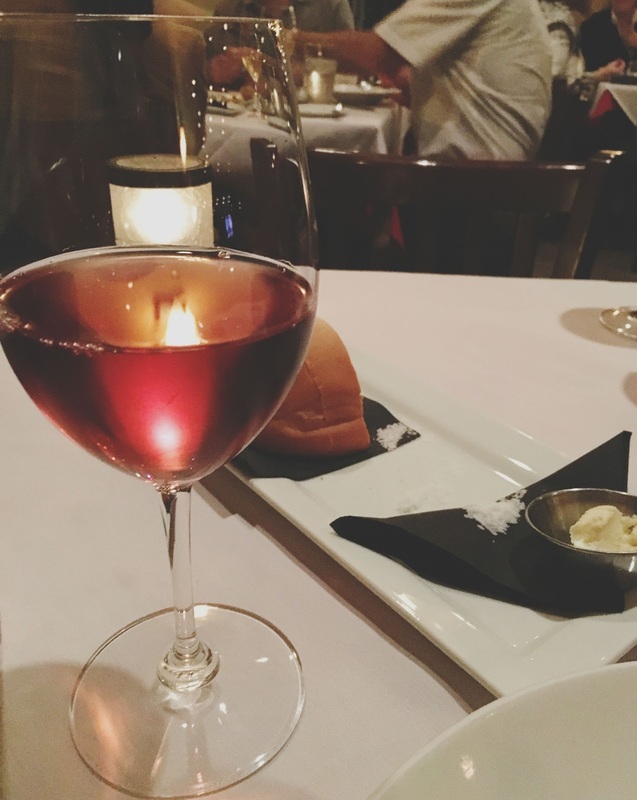 My friend Renia talked about her experience at the restaurant a few weeks ago, and the Houston Press just reported on it. So you see, if everyone in Houston was trying it, I couldn't not try it as well! Jon and I were escorted to a table inside the restaurant's elegant, yet laid back dining room. 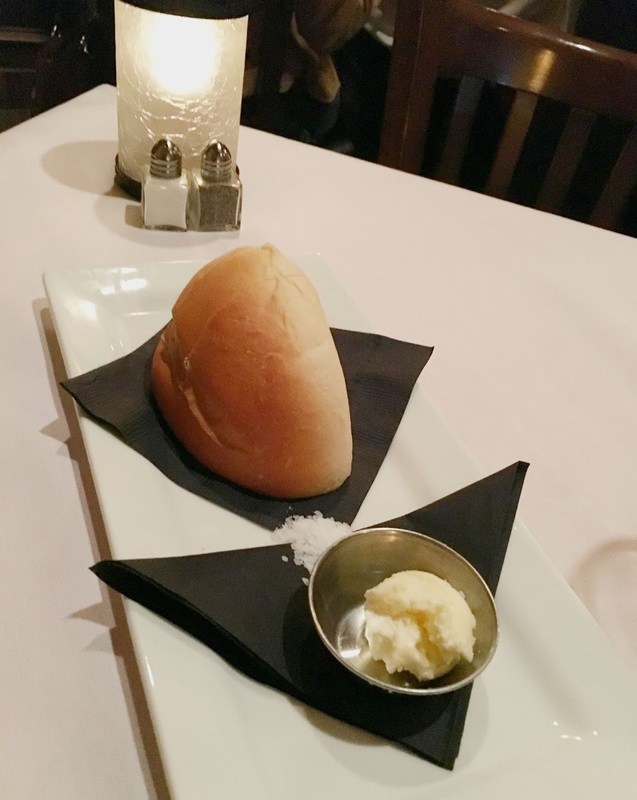 Soon after we were seated, we were greeted with food in the form of a fluffy light loaf of bread, served with course sea salt and butter. Even though we were about to drink a whole lot of rum, our kind server Hector asked us if we would like to start with some wine. I told him thank you, but I'd pass. So I enjoyed a glass of crisp, dry, refreshing Large Twins sangiovese rosé. It was lovely. Then we were presented with our first rum drink of the evening, which was the restaurant's dry version of a mai tai. Craig, the General Manager, explained to us that this drink - made with Mount Gay Black Barrel rum - was to serve as our pre-dinner palate cleanser. We also received a little Rum 101 from him - Did you know that rum can be pot-stilled, which gives it a more pungent aroma and strong taste, and it can also be column-stilled, which is a continuous distillation process that results in a smoother experience? Well, this batch of the restaurant's signature rum was developed with more column-stilling and less pot-stilling and came from a sweeter barrel. In addition to the rum, the mai tai was a concoction of orange juice, pineapple juice, passion fruit, mango, and pisa (a 3-nut liqueur comprised of hazelnut, pistachio, and almond). The resulting drink was sweet and subtly spicy. Drinking it brought me to a place of sunshine and palm trees and waves crashing in the distance. Anyone want to get out of Houston for the weekend and go to the Caribbean with me? 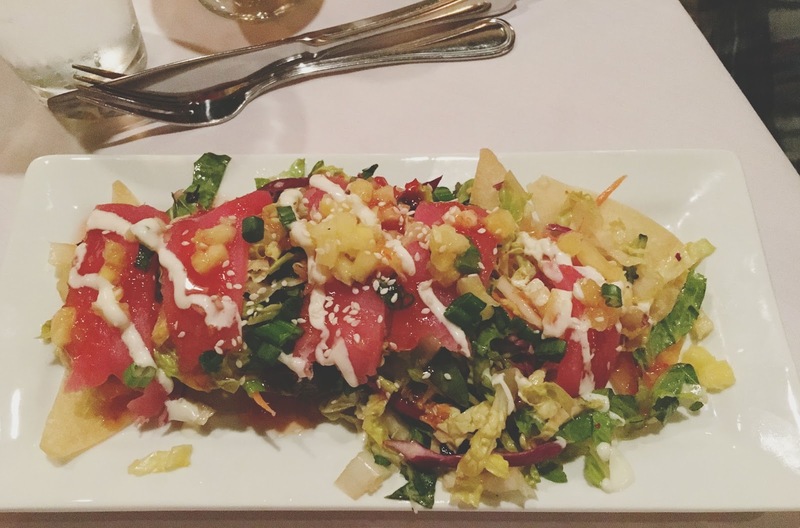 To pair with our mai tais, our first round of food consisted of the restaurant's ahi tuna tostado for Jon, and a couscous salad for me. Jon's ahi tuna was served over a layer of wonton crisps, and it was topped off with sesame seeds, pineapple, mango, and - according to him - a "zingy Asian-style sauce." I didn't eat any of this, but I can attest that it smelled heavenly. Jon could not stop gushing about how incredible it was. I can attest, however, that my food (which was an off-menu item, made to fit my vegetarian diet) was wonderful. Perfectly cooked (al dente) pearl couscous was tossed with pico de gallo and lemon, and was topped with peanuts and a drizzling of pesto. There was just the faintest kiss of cilantro, and I actually found it quite lovely (it didn't have me running for the hills, an effect cilantro *occasionally* has on me). This soft-textured salad was light and absolutely exquisite. It shone on it's own, while simultaneously supporting the bursts of tropical flavors coming from the mai tai. They were a fantastic pair! In addition to enjoying this combo in Houston, let's try it on the beaches of Bermuda, shall we? Next up, we were able to imbibe in some rum and cokes, as well as sample the rum on its own. No, you're not drunk, that glass is just awesome. 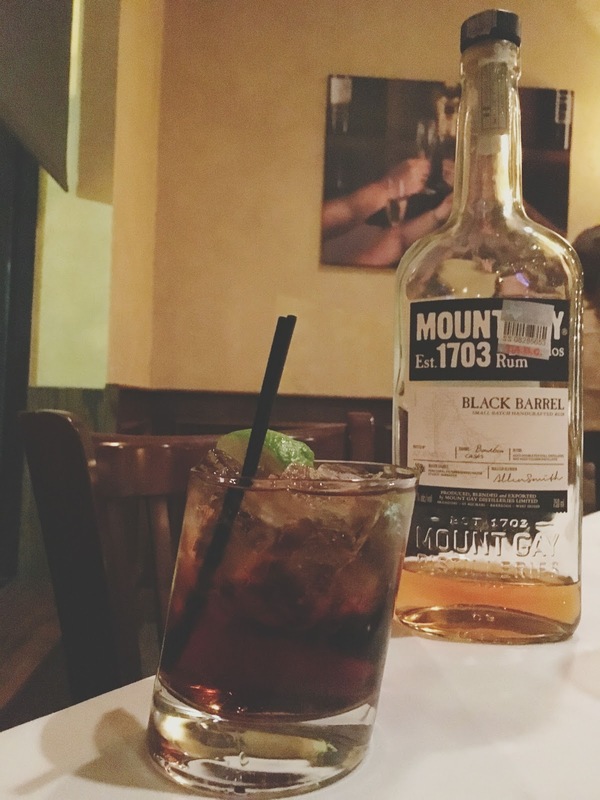 Fun fact about Mount Gay rum: There is no added residual sugar! Many companies like to throw some extra sugar into their rums to sweeten things up, but not Mount Gay. It's complex enough on its own, with a maple-y smell and tasting notes of spice, roasted wood, and vanilla. The oldest rum on record, its origins date back to 1703 in Barbados. Jon was a big fan of it on its own because while it had the mouth feel of rum, the finish was akin to that of a bourbon (aka strong and fiery). For that reason, I preferred it a mixer added to it! Because of the heartiness of this rum, the result of it mixed with the coke was syrupy and full. It tasted very similar to a pure Mexican coke, and an added squeeze of lime brought out some playful nuances in the drink. It was certainly not your typical college-style rum and coke (...anyone? ), but a much more genteel - yet approachable - cocktail! Our food portion of this part of the pairing consisted of the restaurant's seafood pizza for Jon and an off-menu penna pasta with vegetables for me. The pizza looked like something out of a dream. 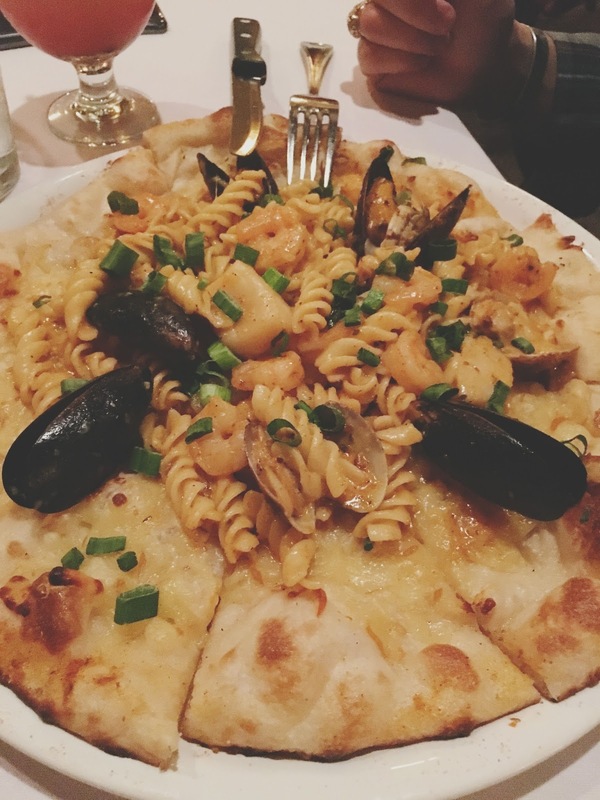 Topped with a garlic Cajun cream sauce, fusili, shrimp, scallops, clams, and mussels, Jon described it as "peppery, spicy, and good." 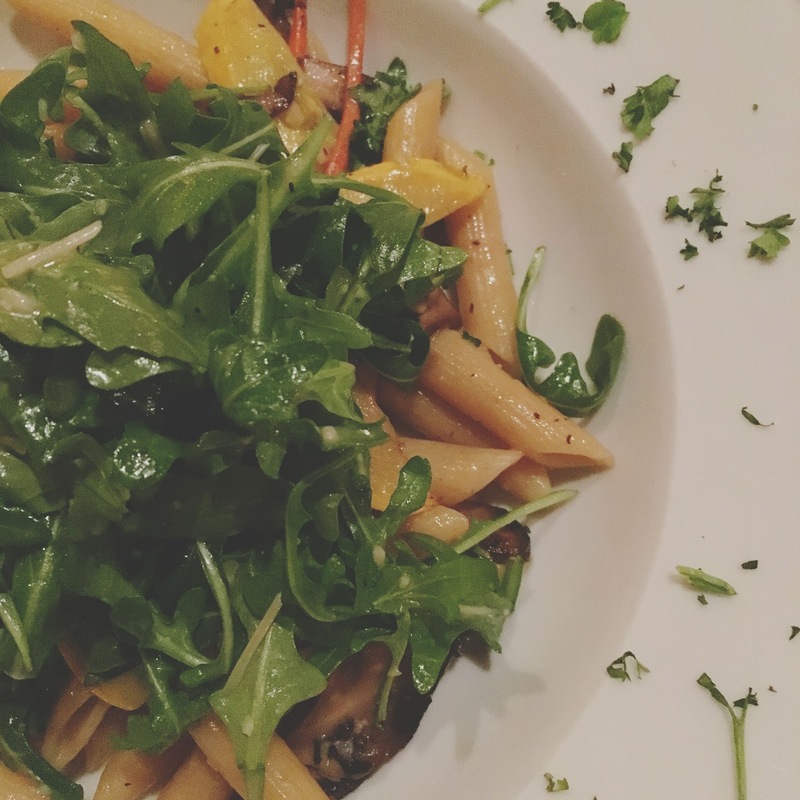 My pasta was topped with fresh arugula and tossed with zucchini, carrots, and mushrooms in a butter white wine sauce. It was slightly sweet (I thought there might have been a hint of honey? ), buttery, and had a good soft crunch from the arugula. The vegetables were tender, but not soggy, and the dish as a whole was earthy, yet light. A small dusting of parmesan was subtle and pleasant. I was definitely into this dish. It had a great combination of bitterness (arugula), saltiness (vegetables/pasta), and sweet (again, honey????). 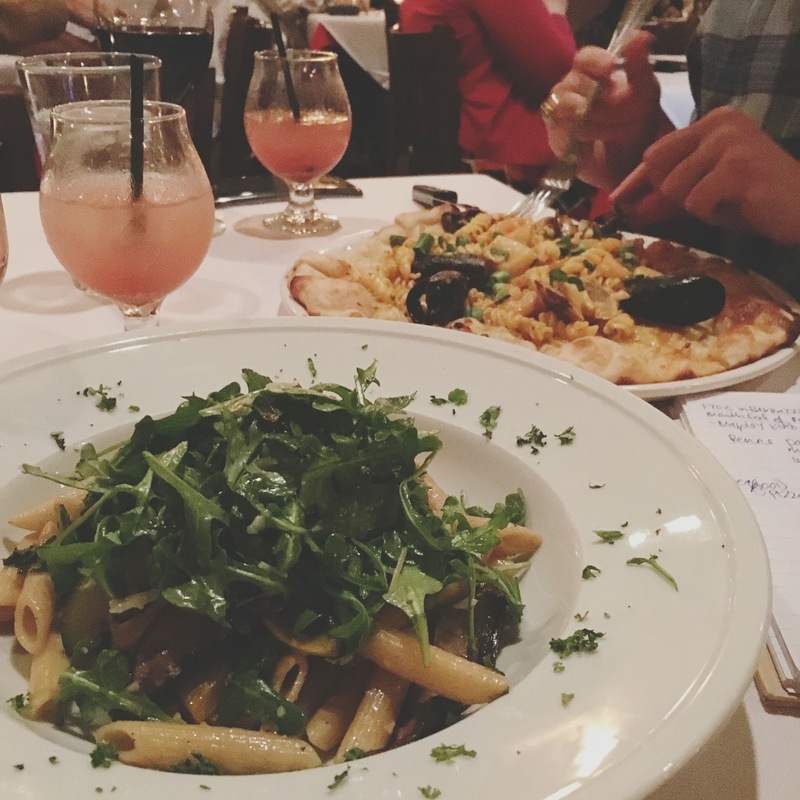 The rum and coke was a wonderful companion to my food in that it brought even more body and depth to the pasta! And last but not least, our final round of food: desserts! To compliment my lighter fare, I was presented with berries and cream, a chef specialty. The blackberries and strawberries were mixed with black pepper and burnt sugar, and topped with a fluffy homemade whipped cream. The whole thing was capped off with a drizzling of - you guessed it - rum! The chef explained to us the process of burning sugar, which results in spicy, candied cinnamon-like pieces. The dessert was light, sweet, tart and incredibly spirited. The rum gave it some major oomph! 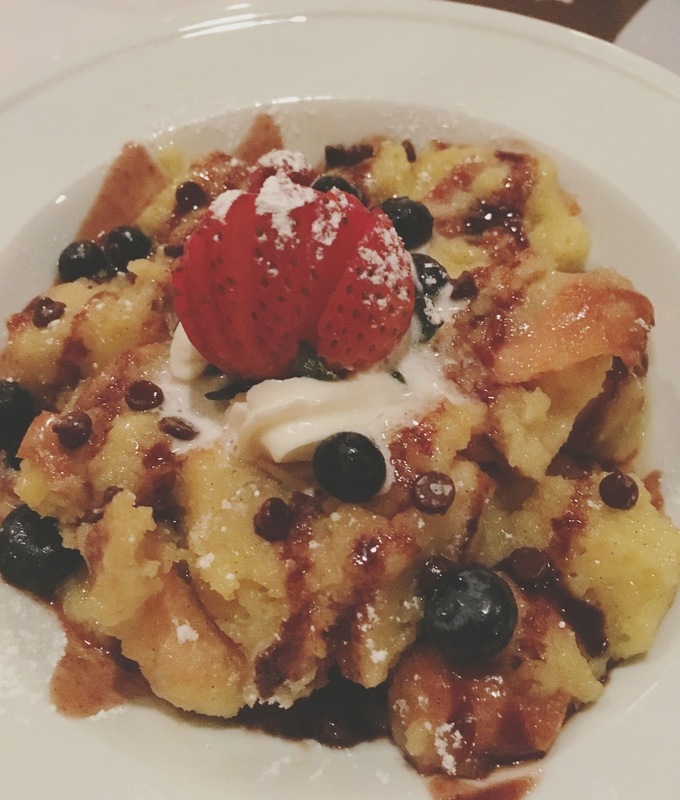 Jon was provided with the restaurant's bread pudding with vanilla custard. This was definitely a heartier dessert, and WOW. I could not stop eating it! 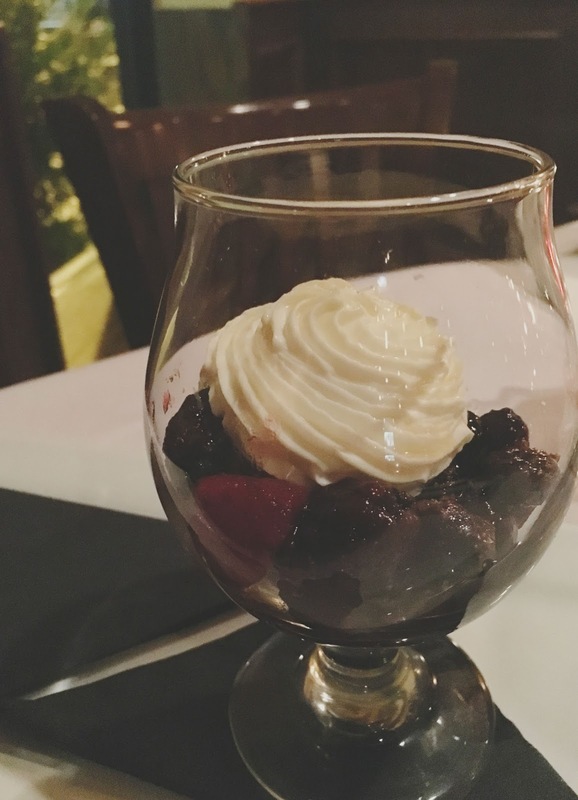 The combo of soft, velvety bread pudding, silky vanilla custard, oozing chocolate sauce, sensational caramel, fresh berries, and mini chocolate chips was pure decadence. The chocolate chip surprises were my favorite part of this soul-warming, toe-tingling dessert! Oh yeah, and it was also topped off with rum. For good measure, you know? 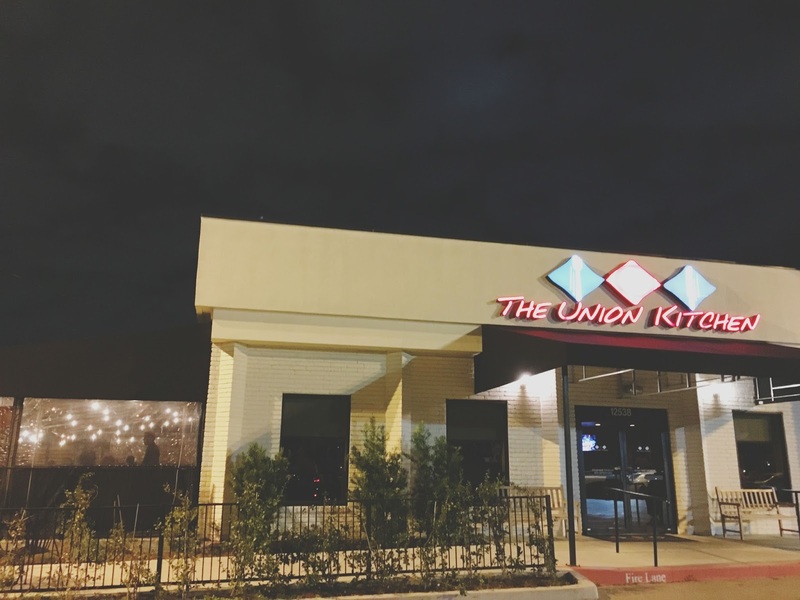 The Union Kitchen is a local Houston restaurant that delivers exceptional food and - as I've recently learned - exceptional rum cocktails. Their passion for concocting well-executed drinks is evident at first sip. For a nice and delicious night out, I cannot recommend this restaurant enough. And definitely give the rum drinks a whirl! I LOVE Union Kitchen. Have you ever been there for brunch? (botomless mimosas, YES PLEASE!) I've never been for dinner, but now I definitely feel like I need to! !